Upper cab mounted on the tower. Boom has an excellent profile. Boom lowered for service and resting on the dolly wheel. 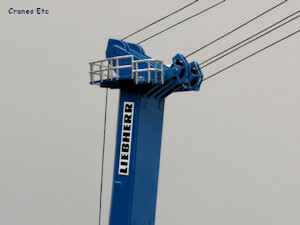 The Liebherr LHM 500 is a mobile harbour crane. 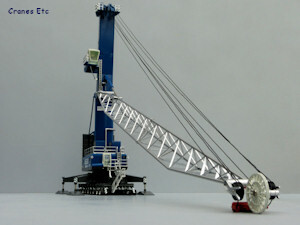 It has a radius of 51m and a maximum capacity of 140t and is optimised for Panamax / Capesize ships. 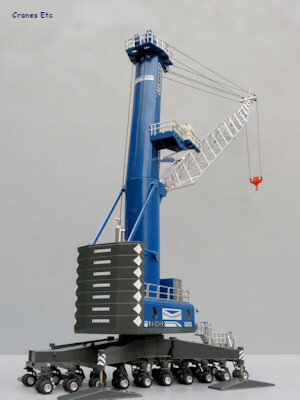 The crane weighs 455 tonnes. The LHM 500 has been superceded by the LHM 550. 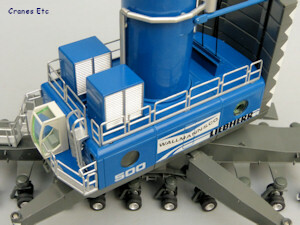 This model is in the colours of Wallmann & Co, which has operated at the port of Hamburg since 1922. 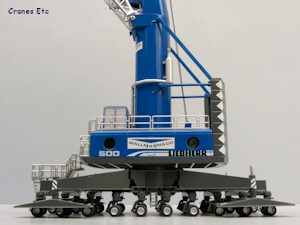 The model comes in a large Liebherr-branded box which has a plastic carry handle at the top. 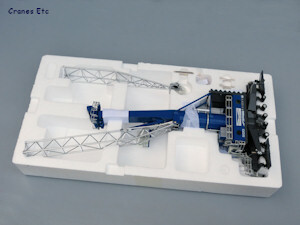 The parts are contained in two expanded polystyrene trays. 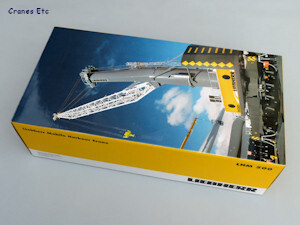 There is no information provided about the real crane, but an instruction leaflet in German and English describes the assembly and operation. The twenty sets of wheels are finely detailed for the scale with nice rubber tyres mounted on detailed wheels and assemblies. Large metal spreader plates are hung off metal beams. The pistons are simple screw threads. 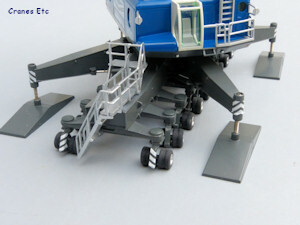 A metal stairway leads to the crane body. 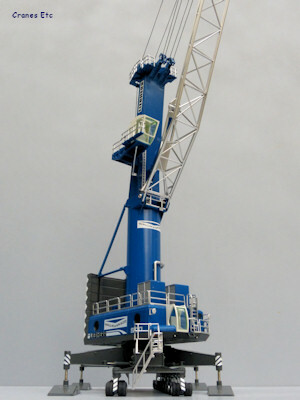 The crane body and counterweight are metal and the graphics and paint scheme are very nicely finished. Metal handrails and lights add to the quality feel and the grilles on the engine boxes look good. The small lower cab has a seat but no console. A hole in one side where a window would be allows the winch to be accessed with a key. 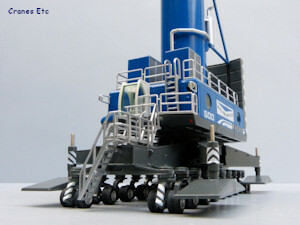 The tower is a solid metal design with the upper cab and platform modelled in metal. A seat is provided inside the cab. At the tower top the pulleys are metal. 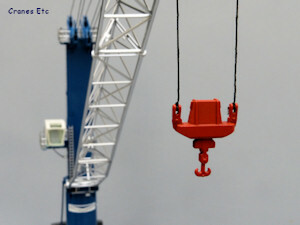 The large lattice boom is cast in two parts and it is really well made and painted. The two sections pin together and are secured by clips and this system works very well. At the boom tip there are more metal pulleys and a dolly wheel for when the boom is lowered to the ground. The tension luffing cylinder has a plastic jacket with pipe detail and a good colour match. The hook is metal and heavy so it provides good tension on the threads. Two-falls of the hoist ropes are facilitated. 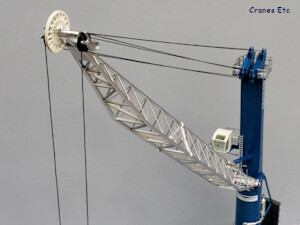 The small wheels roll well and each wheel unit steers independently so all the steering modes of the real crane can be replicated including crab steering. The outrigger beams fold out and the pads can be lowered by unscrewing. 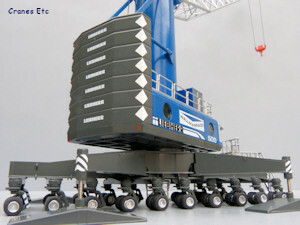 The pads hold the weight of the crane easily allowing the model to be posed wheels-free. The tension luffing cylinder works well to hold the boom and a full range of boom movement is possible, including lowering the boom fully onto the dolly wheel. Boom positions can be held if necessary by tightening the screws at the boom pivot. The winch has two lengths of thread and the hook can be raised and lowered using a key. Equal lengths of thread for each half of the hook are maintained well. 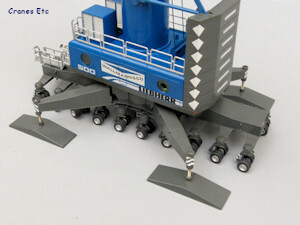 This is really a very good model considering it is 1:87 scale, and it has a high metal content. The paint quality and graphics are very good. 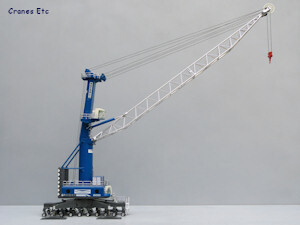 It is a limited edition model with 300 made but it is expensive compared to the version in Liebherr colours. This is a very good model, particularly given the scale of 1:87. It is large and impressive on display and is highly recommended. The model first appeared at the Nuremberg Toy Fair 2014. Each wheel unit can be steered. Boxes with grilles on top of the engines. Metal pulleys at the top of the tower.